Sachin Kamal-Bahl, Vice President and Head, Innovation Center, Global Health and Value, Pfizer Inc.
Pricing is the reputational frontier for big pharma today, so it’s no surprise that those who represent the function— internally and externally—are feeling a bit exposed. But Pfizer’s Sachin Kamal-Bahl has a particular character trait that helps deflect those downside critiques: he always leads from the front. The 43-year-old pharmacist, originally from India, follows a career edict founded on just three short words: “Dare to Try,” a phrase derived from an internal Pfizer-wide initiative to encourage new ideas and taking thoughtful risks through innovative experimentation. The fact is Kamal-Bahl looks at his career as a license to experiment. It began with an early decision to leave India to come to the US to broaden his academic exposure to the interdisciplinary aspects of health services provision—that politically tricky place where reform meets reality. 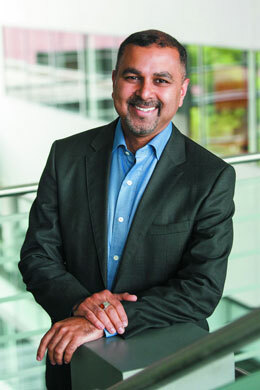 The career path that followed put Kamal-Bahl at the epicenter of a then-emerging function in pharma called “market access,” leading up to today, where he manages the first internal company think tank that develops and integrates innovative approaches based on well-considered risks and strong technical content to address specific access, pricing and valuation challenges and opportunities facing the industry today. The Pfizer Global Health and Value Innovation Center develops different approaches and prototypes and embeds them in internal processes to better position the company to demonstrate value and obtain market access for assets at launch. The Center also has a mandate to devise and test novel P&R models that improve patient access to drug innovations while moving the needle beyond the traditional approaches to drug pricing and financing. “Pfizer’s Executive Leadership Team (ELT) authorized the Center with its own budget, separate from operating unit P&L. It gives us greater leeway to take on new ideas and embed them in a project pilot or prototype; if it works, management will invest and the full business units can take it mainstream,” Kamal Bahl told Pharm Exec. The Center’s status as an incubator of ideas suits Kamal-Bahl’s own background, which began along the traditional credentialing path with a pharmacy degree in Mumbai. A desire to branch out into something more strategic led him to the US and a PhD program in pharmaceutical economics and health services research at the University of Maryland in Baltimore. His research there attracted the attention of industry and in 2003 he joined the Merck & Co. outcomes research and management group, which in 2006 placed him on the Januvia diabetes launch team. “Involvement with this top-selling global brand gave me a front-row seat in the creation of a formal market access function at Merck —and I became a member of Merck’s first Global Access Team.” Later, Merck invited him to assume the role of strategy lead for global health technology assessment (HTA). At the same time, Kamal-Bahl continued to hold adjunct appointments at two leading academic institutions, the University of Pennsylvania’s Leonard Davis Institute of Health Economics and the University of Maryland’s pharmacy school. After more than a decade at Merck, Kamal-Bahl joined Pfizer in 2014 to launch and lead the Global Health and Value Innovation Center, largely because of his interest in creating the first industry think tank specializing in this growth area. “I was excited about being involved in creating something from scratch, especially as it married the freedom of inquiry of my work in academia to the discipline of business strategy and execution.” It also appealed that ELT members like Global Innovative Health group President Geno Germano were early sponsors of the Center, which continues today under Germano’s successor, Albert Bourla. Kamal-Bahl cites a number of accomplishments in establishing the Center’s bona fides, on both the internal and external front. A personal point of pride is expanding Pfizer’s engagement with relevant stakeholders, in a much more systematic manner. “We are reaching out to talk to payers, providers and especially patients to solve for access and pricing issues,” he says. This, in turn, has led to the creation of internal process efficiencies that make it easier for the company to demonstrate value for products at and prior to launch, and later in the post-marketing phase. To navigate through such turbulent waters, Kamal-Bahl highlights three skills that future biopharma leaders and their teams require to succeed. First is to ensure your people are allowed to be creative, to incorporate ideas that are unconventional, and to take prudent risks —while acknowledging too, that some of these ideas will fail. Second, your team should be a “safe haven” for members to stray from the path of the safe and narrow. If they can do that, many more useful ideas are likely to surface for debate. В интеренете нашел классный интернет-сайт на тематику Профессиональные электроплиты. Этот нужный сайт , он рассказывает про https://xn--80aaahqpcuvhvipz6j.com.ua.